Successfully Added Quad Band Dual SIM Touch Screen Cellphone with Drag + Drop Icons to your Shopping Cart. 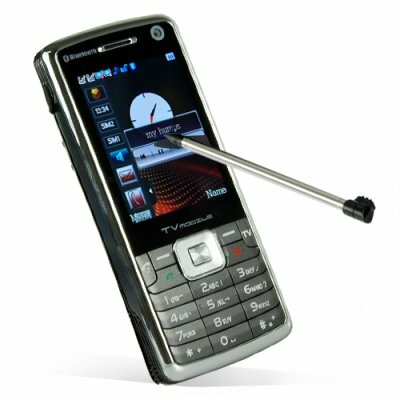 Quad Band Dual SIM Touch Screen Cellphone with Drag and Drop Icons is the GSM digital phone you have been waiting for! It comes with a unique screen side bar feature, supported by motion control function, letting you create your own unique screen interface. The new CVSC-M27 mobile phone is a unique touchscreen cellphone, designed with a very cool touch sidebar which acts like a slide IN/OUT menu bar, with desk top like icons, where the user can drag and drop, and move around the icons to design their perfect screen interface. This phone comes with all your favorite features, from font/back camera to TV function, dual standby mode, Bluetooth, MP3/MP4 player and many more. Further-more the CVSC-M27 is designed with advanced hand writing technology to recognize characters, along with dual screens embedded in the software for fast hand writing function, just write a character in one screen and another in the second screen, the software will recognize the character one after the other. This innovative new function will enable you to wright faster than ever before. In addition, you can watch videos in either portrait or landscape view thanks to accelerometer technology, all you have to do is turn the phone 90 deg and the screen rotates. Included with this mobile phone is a 1 GB SD card which lets you record hours of video and audio clips, and with dual SIM card and dual stand-by function, have two networks running simultaneously at the same time. This is mobile phone that will attend to your every entertainment and calling needs. This hot new model is built with form and function in mind for great user experience, along with webcam support via the on- board camera. This cellphone is in stock now and available for single sample or bulk orders. Order your stock now and don't forget to check our mobile phone accessories section to see our selection of Bluetooth speakers and earpieces. MicroSD/TransFlash memory card slot with 1GB card included. Allows expansion and swapping of cards. Where is the stylus located? The antenna is built into the tube of the stylus. Just retract the antenna from along with the stylus. How can this mobile phone be used as a storage device? When you connect the CVSC-M27 cell phone, 3 options will appear, web cam, storage device and COM port, in order to use the mobile phone as a storage device, switch the phone off. And to use the cellphone as a webcam, just select the webcam option. Does the analog TV tuner work in the USA? Yes, you will be able to receive analog TV channels where ever you are, whether in North America or anywhere else in the world that broadcasts TV on an analog signal. Got, thank you excellent product, will buy here yet!!! To you for high-quality ellektroniku. This phone is great! The touch screen is really responsive. The color and clarity is amazing. It took some time figuring out how to get my own background on the screen the I did it! I haven't found out how to set a different tone for text messages but I'm still learning how to use the phone. Also I can't get the normal camera to work. The one that faces me works great but it won't switch to the other one. Hopefully I'll figure it out. I'm really happy with this phone overall! Thanks Chinavasion! !